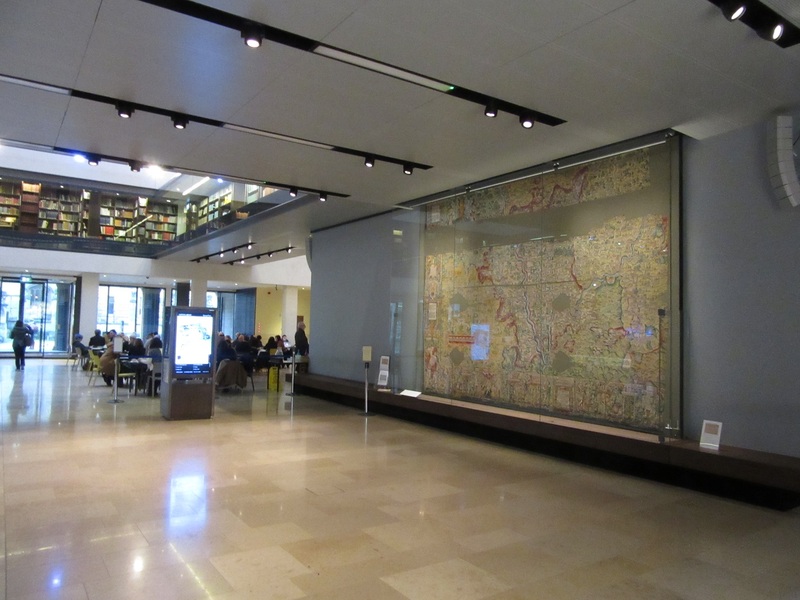 On Tuesday 10 January, the Library’s Sheldon tapestry maps of Gloucestershire and Oxfordshire were cleaned as part of the initial phase of their restoration. Four of these tapestry maps were made for the former Weston House in south Warwickshire in or around 1590, the maps centred on Gloucestershire, Oxfordshire, Warwickshire and Worcestershire, all of which were able to feature Weston House, the home of Ralph Sheldon, who commissioned them. 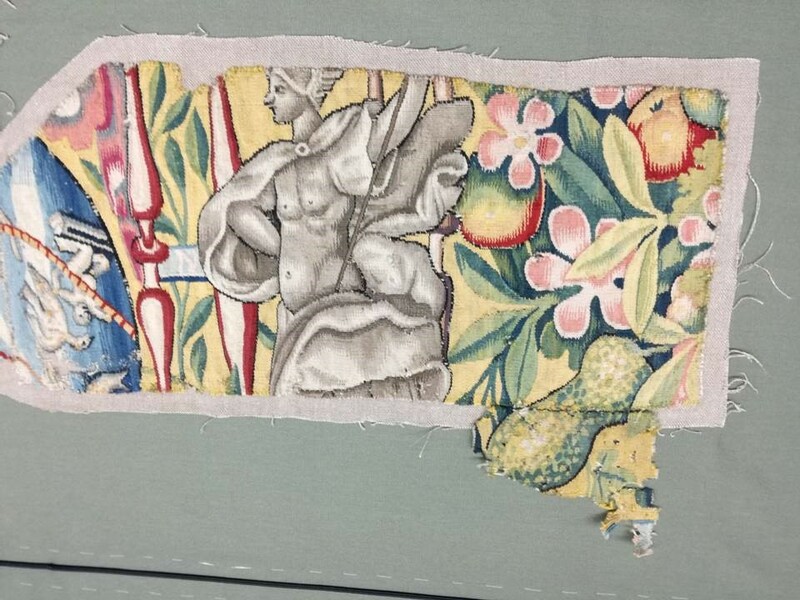 The Bodleian owns a substantial part of what remains of the Gloucestershire tapestry, bought at auction in 2007; and Oxfordshire and Worcestershire, (both part of the 1809 Gough bequest). The Worcestershire tapestry hangs in Blackwell Hall, and was the first of the three to be treated by our colleagues from the National Trust. 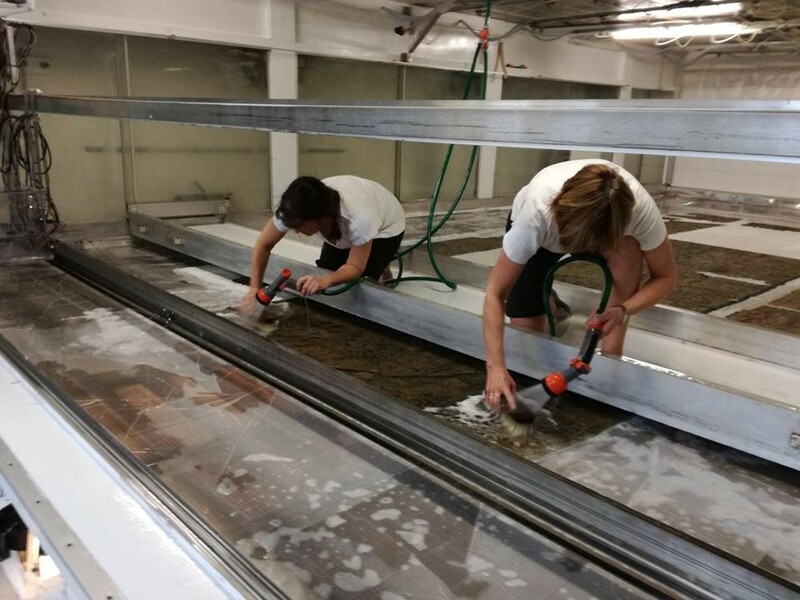 In October 2016, Gloucestershire and Oxfordshire were delivered to the National Trust’s textile conservation studio on the Blickling Estate in Norfolk, and from there preparation was made for cleaning. 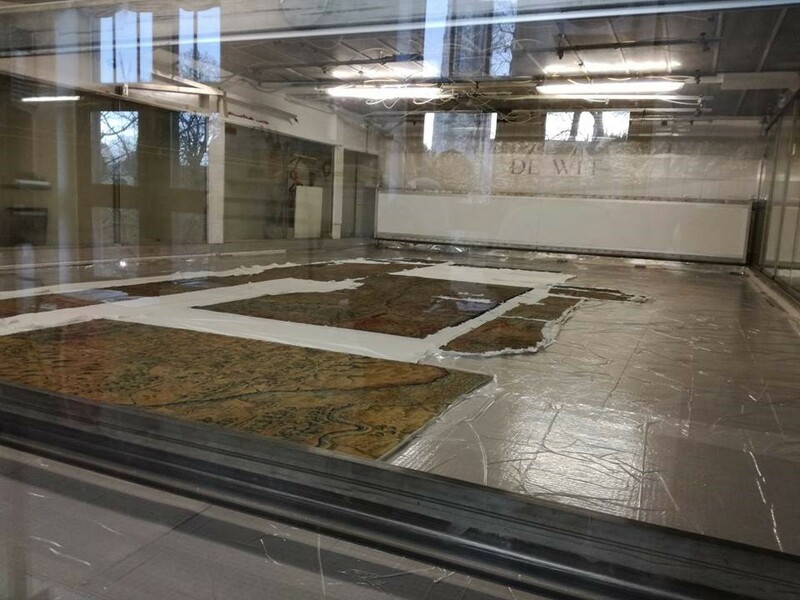 The only facility large enough to clean tapestries of this size is at De Wit Royal Manufacturers in Mechelen, Belgium (halfway between Brussels and Antwerp), and so the tapestries were delivered in early January. 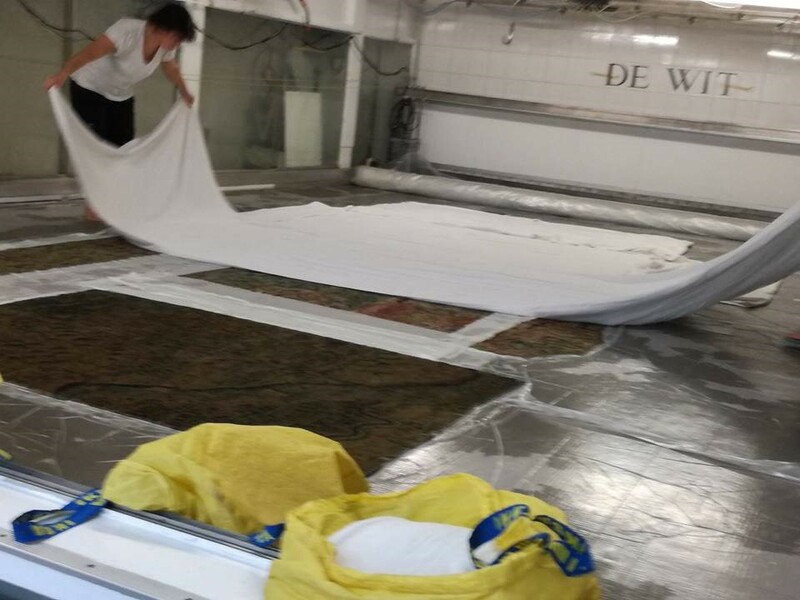 De Wit’s team prepared the tapestries for cleaning on the previous day, so by the time we arrived to watch the process, Fig.1 shows pretty much what we saw, with everything laid out in a sealed chamber. Fig.1: Awaiting cleaning – Gloucestershire in the foreground; Oxfordshire’s fragments beyond. Cleaning began around 10am, as the chamber quickly filled with steam, and suction was applied from below. Before long, nothing could be seen inside the chamber, but De Wit had a camera in situ which moved across the tapestries, showing us absolutely everything at very high resolution on a screen in the “control area” next to the chamber. This procedure lasted over an hour, during which time we could monitor the liquid dropping down beneath the chamber, and samples of which were being collected in clear cylinders. Fig.2: Cleaning over – the mist starts to recede. With the cleaning phase completed, the De Wit team accessed a metal platform which moved on tracks above the tapestry. Fig.3 shows them rinsing the tapestries with hosed water and soft brushes. This process lasted around half an hour. 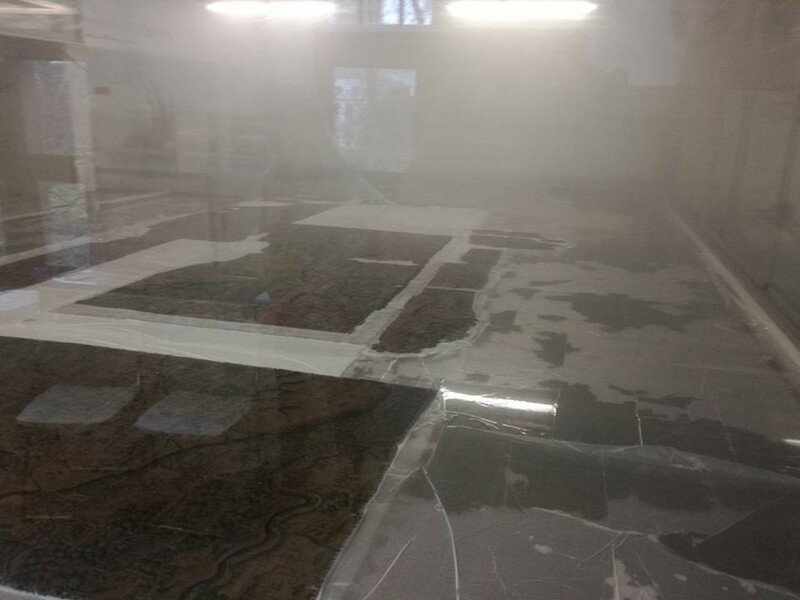 Drying took place during the afternoon, beginning with large towels draped over the tapestries, that were then covered with plastic. This process took about five minutes, and was then repeated with fresh towels. Next, highly absorbent paper was used instead of towels, again compressed beneath plastic, and again repeated. 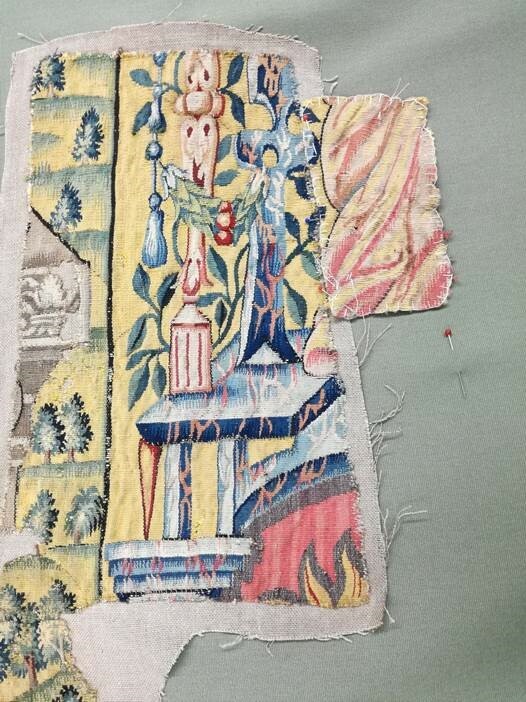 To give some sort of impression as to the changing state of cleanliness of the tapestries, Fig.5 shows how the colour of the water emerging from the cleaning process. 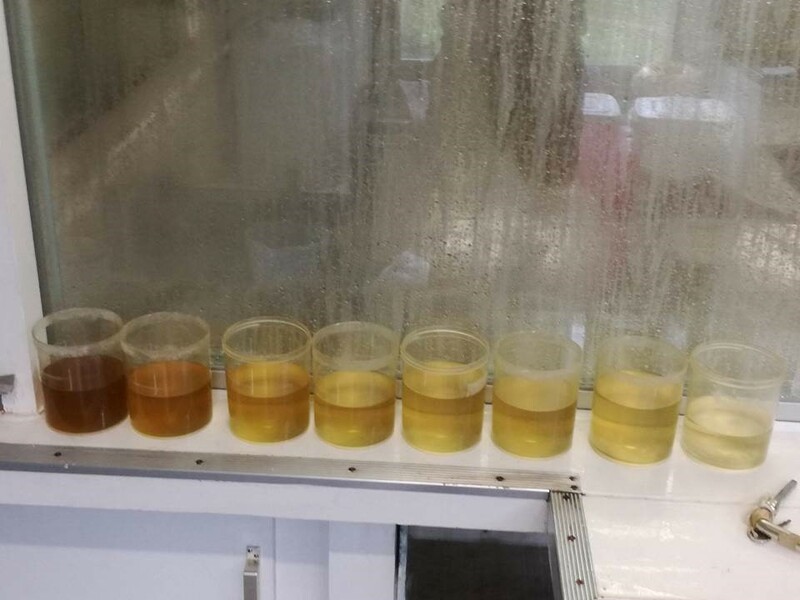 The cylinder on the left was the first to be collected, that on the right the last. Quite a contrast. By 6pm we were able to enter the chamber to inspect at close hand the tapestries, checking the colours, and also being impressed at how dry they were. 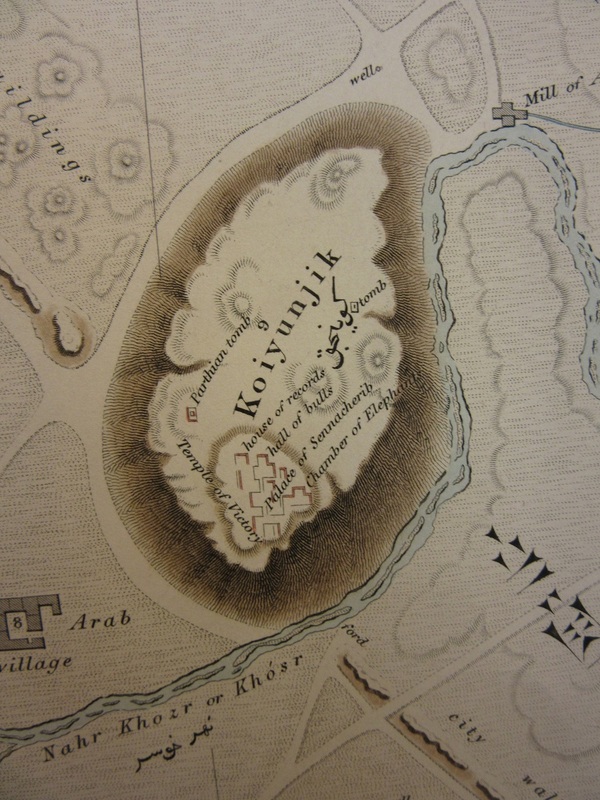 Fig.6 shows and area north-east of Oxford (towards modern Milton Keynes), and the colours are clearly stunning. A fortnight later, we were able to travel to Norfolk and discuss how work might begin with our colleagues from the National Trust. The tapestries had been safely returned from Mechelen. 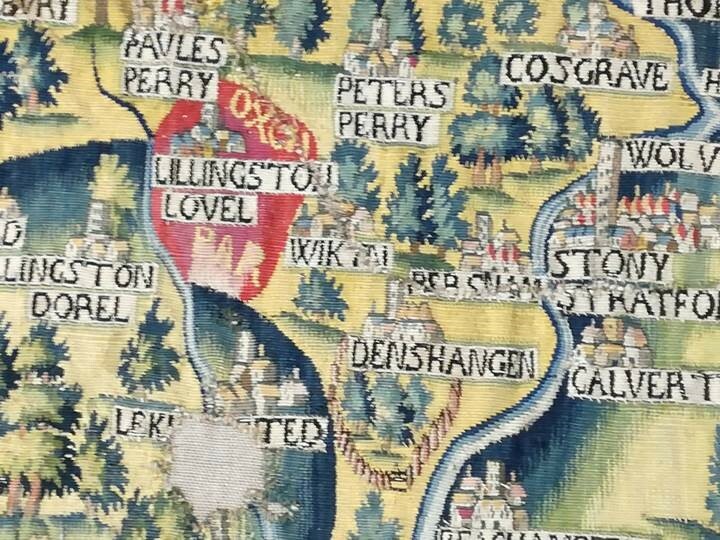 Oxfordshire is planned to be the next tapestry to be displayed, and there are plenty of issues to contemplate, not least the number of gaps in the tapestry; its greater height and width than Worcestershire; and the question of whether we should incorporate a braid around the cartographic perimeter of the tapestry. One major advancement however, concerned the status of six loose Gloucestershire fragments, which had not been sent to Belgium. Since the nineteenth century, it has been accepted that they belonged to Gloucestershire. On closer examination, we were able to conclusively prove that three of the six fragments are indeed part of Oxfordshire (see Figs 7 and 8). This was a terrific breakthrough. During the day, we were also able to confirm all the place name details from Gloucestershire (which will need some serious restoration work to make them fully legible). Fig. 9 The Worcestershire Tapestry in Blackwell Hall. This entry was posted in Cartography on 30 January 2017 by stuart. How do you map a long thin country like Chile?, by making a long thin map of course. Chile’s length, at 2,690 miles, is ten times longer than its width. This map, published in 1990 in the United States by the Cultural Department of the Embassy of Chile to the United States has tourist information on both the front and back of the map as well as information on the Country and a historic background. This entry was posted in Cartography on 26 January 2017 by stuart. This beautiful map of Nineveh is a sad remainder of the recent destruction caused by ISIS forces in the Northern Iraq area. 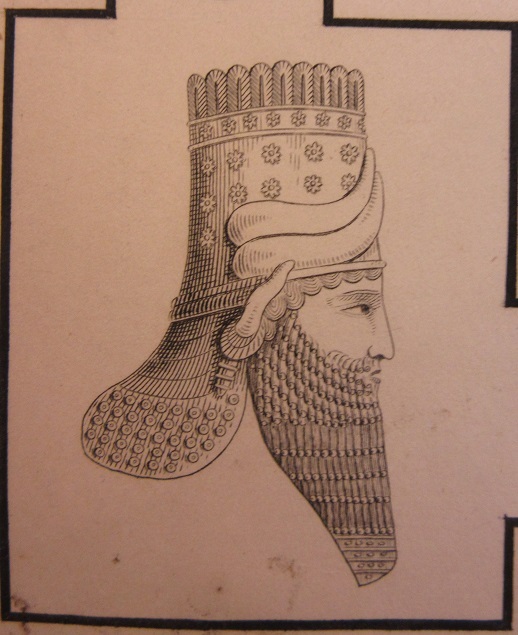 For a time Nineveh was the greatest city in the World, capital of the Assyrian Empire, until its sacking in 612BC. 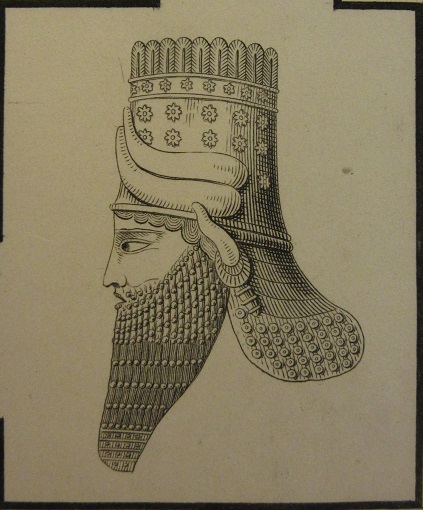 Trade between the Mediterranean region and the East travelled along the Tigris River, bringing great wealth to the city. As well as the threat posed by opposing forces fighting in and around Mosul the area is also down-river of the Mosul Dam, declared in 2006 to be the most unstable in the world. Mosul is situated on a major fault-line and any tectonic activity in the area, which has in the past caused damage to temples and buildings at Nineveh, could be disastrous. caused considerable damage to the site. Modern Mosul now spreads east beyond the historical site of Nineveh with suburbs between the two mounds of Koiyunjik and Nebbi Yunus. As of the 9th of January the ruins of Nineveh were on the front-line of territory held by ISIS and the Iraqi Army. 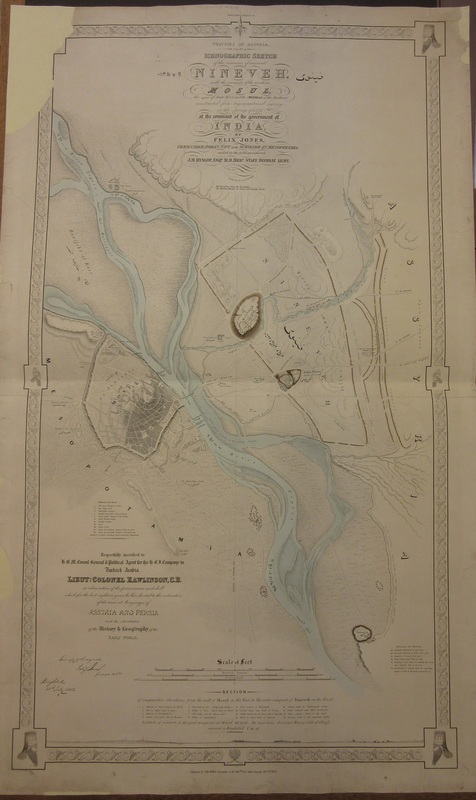 The map is published by the East India Company, which up until a few years after the date of the map controlled large parts of the sub-continent. Given a Royal Charter to trade with India in 1600 the company subdued large parts of the country and it was only with an act of Parliament in 1858 following rebellion in 1857 that the British Government, in the form of the Raj, took over control. This entry was posted in Cartography, History on 12 January 2017 by stuart.